Dmitri Andreikin held Magnus Carlsen to a draw, so did Pentala Harikrishna to the tournament leader, Pavel Eljanov, in Round 3 of Tata Steel Masters 2017. 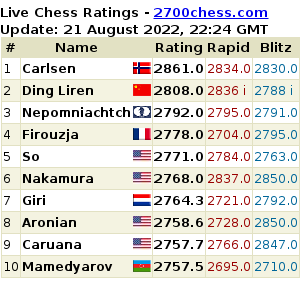 This enabled the victors of the day: Wei Yi, Wesley So, and Sergey Karjakin catch up and tied in second place. Wesley So vs. Richard Rapport, Round 3 Tata Steel Masters 2017. 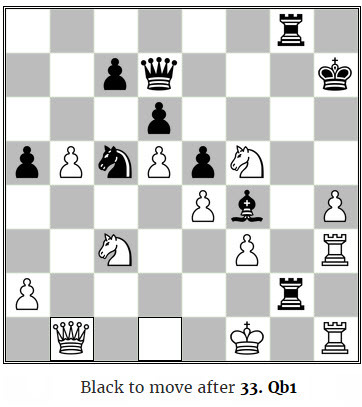 Position after So’s (white) 33. Qb1. 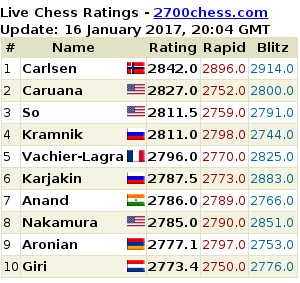 This win by Wesley So put him in 3rd position in the live ratings, surpassing Vladimir Kramnik, after achieving the rating of 2811.5. Replay all the games played so far in Tata Steel Masters 2017. Wow good news for so…. Rommel, update ka parati ha? TY. Tingan natin kung mamaintain ni Wesley ang hot streak niya. Strange game. Don’t know who is winning. QXN!